Portrait of Ippolito de' Medici by Titian. Ippolito de' Medici (1511 – 10 August 1535) was the illegitimate only son of Giuliano di Lorenzo de' Medici. Ippolito was born in Urbino. His father died when he was only five (1516), and he was subsequently raised by his uncle Pope Leo X and his cousin Giulio. When Giulio de' Medici was elected pope as Clement VII in 1523, Ippolito ruled Florence on his behalf (1524–1527). 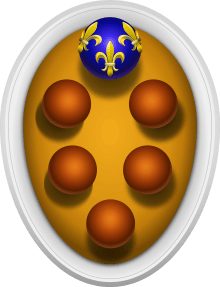 After the siege of Florence (1529–1530), however, Clement favored his illegitimate nephew Alessandro as the family member to take charge of Florence. To assist and succeed him in church affairs Clement VII created his cousin Ippolito a cardinal on 10 January 1529, and on the same day named him first archbishop of Avignon, a position which brought him a considerable income. Since he was only eighteen, he could not be consecrated a bishop or even be the Administrator of the diocese without a papal dispensation. Ippolito was named Cardinal Priest of Santa Prassede, though there is no evidence that he was ever ordained priest or consecrated bishop. His own choice for himself was to be ruler of Florence, not a cleric, and he spent the rest of his life trying to renounce his clerical calling and depose his cousin Alessandro. On 3 May 1529 Cardinal Ippolito was named Papal Legate in Perugia. On 12 August 1529, Cardinal Ippolito de'Medici was one of the three Cardinal Legates who met the Emperor Charles V at Genoa, with the purpose of conducting him in state to his coronation as Emperor in Bologna. In Bologna he participated in the ceremonies of the coronation. On 15 February 1530, Pope Clement granted Cardinal Ippolito a ⅓ share in the annual papal income from the town and territory of Clusium for his lifetime. Ippolito was sent to Hungary in the Spring of 1532 as Papal Legate, departing from Rome on 8 July, according to Pietro Aretino, writing in his diaries. He was in Ratisbon by 12 August. There he demonstrated a talent for soldiering, leading 8000 Hungarian soldiers against the Ottoman Turks, though the Sultan was unwilling to move forward so late in the season, and the Emperor only had sufficient forces for defense, not offence. When the Emperor returned to Italy early in the next year, Cardinal Ippolito followed him. On 3 July 1532, Cardinal Ippolito was named Vice-Chancellor of the Holy Roman Church, the most lucrative office in the Roman Curia. Along with that post he was transferred to the Titular church of San Lorenzo in Damaso. He was a friend to, and possibly had a liaison with, Giulia Gonzaga, the Countess of Fondi. He loved Catherine de' Medici but they never married. Alessandro de' Medici caught him and Catherine de' Medici in a private embrace. However, when he was sent away as a Cardinal, they weren't allowed to see each other any longer. Some theories suggest that the reason Clement made Ippolito Cardinal was to keep him and Catherine de' Medici apart. By 24 April 1531 Catherine had been promised to Henri, the son of King Francis I of France, in a draft contract of marriage. Catherine was 11, and Cardinal Ippolito was 21. Ippolito's cousin, Pope Clement, died on 25 September 1534. The Conclave elected Cardinal Alessandro Farnese on October 12, and he chose the name Paul III. In 1535, free of his cousin's influence, Cardinal Ippolito acted as Florentine ambassador to the emperor Charles V, happily conveying complaints against the administration of Alessandro de' Medici. Suffering from a low-grade fever for eight days, Ippolito died from malaria in Itri, in southern Lazio, although there were rumors that he had been poisoned by Alessandro de' Medici, whose abuses he was intending to denounce; or by Pope Paul III, who aimed to acquire Ippolito's lucrative benefices for his own nephews. ↑ Saint Marthe, Denis (1716). Gallia christiana (Tomus primus ed.). Paris: Imprimerie royale. p. 831. Eubel, Conradus (ed. ); Gulik, Guilelmus (1923). Hierarchia catholica, Tomus 3 (second ed.). Münster: Libreria Regensbergiana. pp. 20, 126–127. ↑ Salvador Miranda, The Cardinals of the Holy Roman Church, Medici, Ippolito de', retrieved: 2016-10-09. ↑ Eubel, III, p. 20 note 7. L. Fiumi, "La legazione del Cardinale Ippolito de' Medici nell' Umbria", Bollettino della regia deputazione di storia patria per l'Umbria, 5 (1899), pp. 481–587. ↑ Giovanni Sassu (2007). Il ferro e l'oro: Carlo V a Bologna (1529-30) (in Italian). Bologna: Editrice Compositori. p. 105. ISBN 978-88-7794-590-7. ↑ Eubel, III, p. 20 note 7. ↑ Robert Walter Carden (1911). The life of Giorgio Vasari: a study of the later renaissance in Italy. H. Holt. pp. 18–20. ↑ Baronio, Annales ecclesiastici Tomus 32, under the year 1532, § 24, p. 236. ↑ Pastor, X, p. 200. ↑ Cardella, IV, p. 109. ↑ Etta V. Thomsen, "Ippolito de' Medici', in: Peter G. Bietenholz; Thomas Brian Deutscher (2003). Contemporaries of Erasmus: A Biographical Register of the Renaissance and Reformation, Volumes 1-3, A-Z. University of Toronto Press. p. 417. ISBN 978-0-8020-8577-1. ↑ Cardinal Ippolito's predecessor as Vice-Chancellor, Cardinal Pompeo Colonna, had been Cardinal Priest of San Lorenzo in Damaso and Archbishop of Mondovi in Sicily. Ippolito was succeeding Colonna in all three posts. He could only be Administrator of Mondovi, however, since he was not a bishop. Eubel, III, p. 64 and p. 250. ↑ Cf. James Montgomery (1835). Eminent Literary and Scientific Men of Italy, Spain, and Portugal ...: Dante. Petrarch. Boccaccio. Lorenzo de' Medici [etc.] Bojardo. Berni. Ariosto. Machiavelli. London: Longman, Rees, Orme, Brown, Green, & Longman. pp. 188–189. Baronio, Cesare (1878). Augustin Theiner, ed. Annales ecclesiastici, denuo excusi et ad nostra usque tempora perducti ab Augustino Theiner... (in Latin). Tomus 32 (1527-1541). Barri-Ducis: Bertrand. pp. 233–237. Cardella, Lorenzo (1793). Memorie storiche de cardinali della Santa romana chiesa (in Italian). Tomo Quarto (IV). Roma: Pagliarini. pp. 107–112. Crews, Daniel A. (2003). "Spanish Diplomacy and the Mysterious Death of Cardinal Ippolito de' Medici". Mediterranean Studies. 12: 103–110. JSTOR 41166953. (registration required (help)). Giordani, Gaetano (1842). Della venuta e dimora in Bologna del S. P. Clemente VII per la coronazione di Carlo V, imperator ... 1530 (in Italian). Bologna: Fonderia e Tipografia Governativa - Alla Volpe. Knecht, R. J. (16 July 2014). Catherine De'Medici. New York: Routledge. p. 12. ISBN 978-1-317-89687-6. Pastor, Ludwig (1910). The History of the Popes : from the close of the Middle Ages, Volume X. London: Kegan Paul Trench Trübner. Retrieved 2016-10-09. Rebecchini, Guido (2010). Un altro Lorenzo: Ippolito de' Medici tra Firenze e Roma (1511-1535) (in Italian). Venezia: Marsilio. ISBN 978-88-317-0646-9. Weaver, Elissa Barbara (1982). "Ippolito de' Medici , Humanist". Renaissance Quarterly. 35 (4): 674–677. Wikimedia Commons has media related to Ippolito de' Medici.